Italian physician; born in Germany at the end of the fourteenth century. He settled in Italy, where the Senate accorded him citizen's rights in Viterbo, and, in 1405, in Rome; confirmed by Pope Innocent VII. Feb. 6, 1406. He was exempted from toll, from forced service, and from wearing the Jewish garb, and was allowed to carry arms. Pope Martin V. made him his private physician, which position he retained under Martin's successor, Eugene IV., who (1433) confirmed his citizenship and pension. 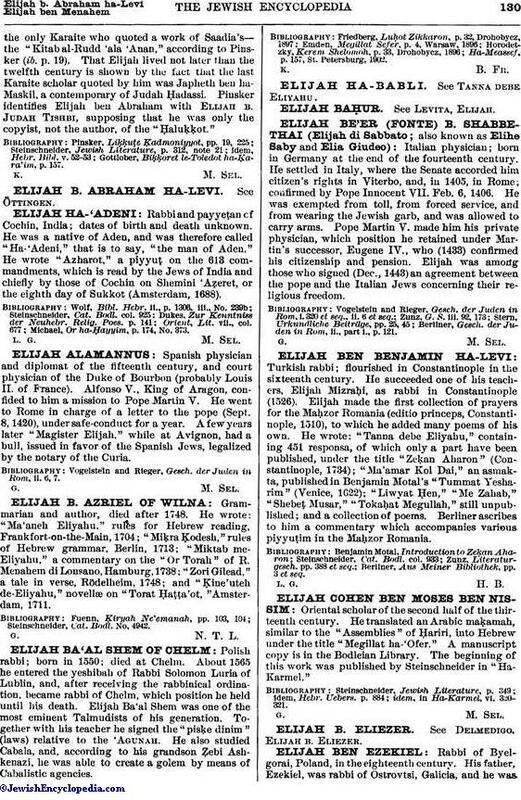 Elijah was among those who signed (Dec., 1443) an agreement between the pope and the Italian Jews concerning their religious freedom. Berliner, Gesch. der Juden in Rom, ii., part i., p. 121.